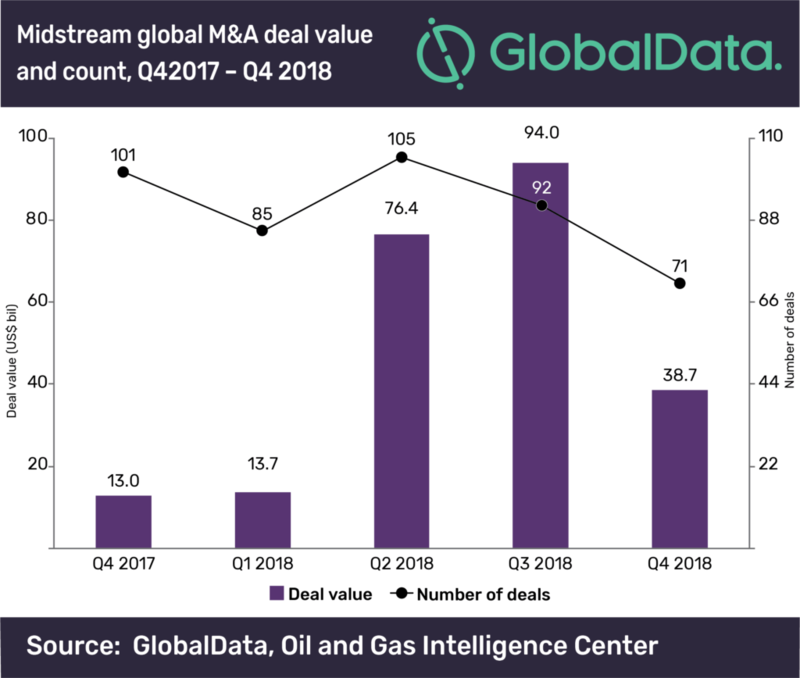 A total of 71 M&A deals with a combined value of US$38.7bn were registered in the midstream oil and gas industry in Q4 2018, according to GlobalData, a leading data and analytics company. Of the total M&A deals, 44 deals, with a combined value of US$28.5bn were domestic acquisitions. The remaining 27, with a combined value of US$10.3bn, were cross-border transactions. A quarter-on-quarter comparison shows a marginal decrease in cross-border transaction values in Q4 2018, compared to US$10.4bn in Q3 2018. However, domestic transaction values decreased by 66% in Q4 2018, compared to US$83.6bn in Q3 2018. The company’s latest report: ‘Quarterly Midstream M& Deals Review – Q4 2018’ states that there were 24 midstream M&A deals (with values greater than US$100 million), together accounting for US$38.1 billion, compared with 28 deals worth US$93.3 billion in Q3 2018, representing a decrease of 14% in the number of deals. Europe, Middle East, and Africa accounted for 32% share in Q4 2018, comprising 23 acquisitions, of which 12 were cross-border and the remaining 11 were domestic acquisitions. The Asia-Pacific region accounted for 12 global deals in Q4 2018, of which eight were cross-border acquisitions and the remaining four were domestic acquisitions. EnLink Midstream’s definitive agreement to acquire the remaining 78.3% interest in EnLink Midstream Partners was the top deal registered in Q4 2018. The transaction is estimated to have an enterprise value of approximately US$8.6bn and an equity value of approximately US$5.1bn. Another landmark deal that was recorded in Q4 2018 was Antero Midstream GP’s agreement to acquire Antero Midstream. The transaction has an enterprise value of approximately US$7.2bn. The total equity value of the transaction is approximately US$5.8bn.